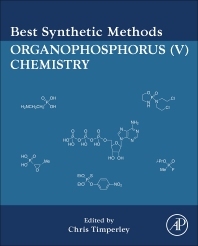 Best Synthetic Methods: Organophosphorus (V) Chemistry provides systematic coverage of the most common classes of pentavalent organophosphorus compounds and reagents (including phosphonyl, phosphoryl, and organophosphates), and allows researchers an easy point of entry into this complex and economically important field. The book follows the Best Synthetic Methods format, containing practical methods, synthetic tips, and shortcuts. Where relevant, articles include toxicity data and historical context for the reactions. Typical analytical and spectroscopic data are also presented to enable scientists to identify key compound characteristics. The book is a valuable companion to research chemists in both academia and industry, summarizing the best practical methods (often originating in difficult-to-access, foreign-language primary literature) in one place. It is ideally suited for those working on industrial applications of these compounds, including insecticides, herbicides, flame retardants, and plasticizers.